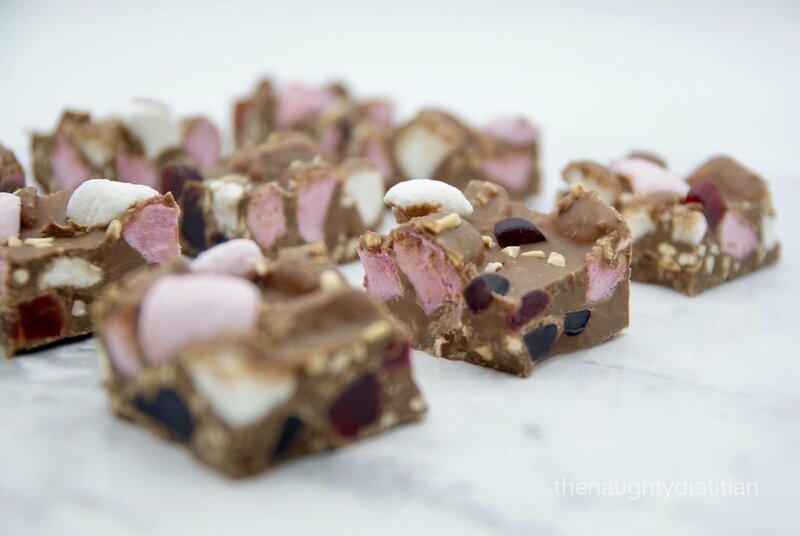 Today’s new recipe is Gluten Free Rocky Road! 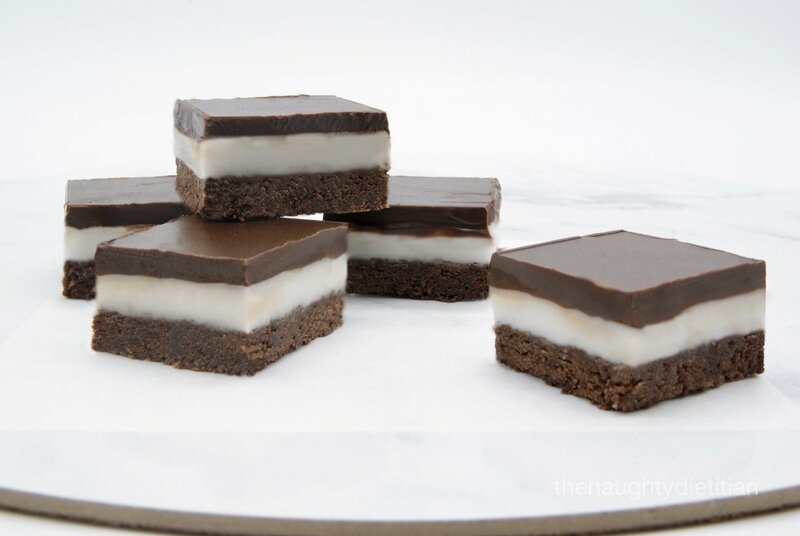 It’s such a fun and easy slice to make and perfect for party season!! I created more of a traditional rocky road slice using marshmallows, peanuts and coconut, but you can adapt this quick and easy recipe to include any ingredients. I’ve seen some recipes with pistachios, turkish delight or even white chocolate. Just remember to double check the confectionery you plan to use is gluten free if you plan to make a GF version. Last week I made this Gluten Free Passionfruit Slice and it was really tasty! I had been wanting to make a passionfruit slice for a while, so I took the opportunity to bake it for a work meeting. The slice contains a buttery biscuit base, jelly like condensed milk filling and passionfruit topping. 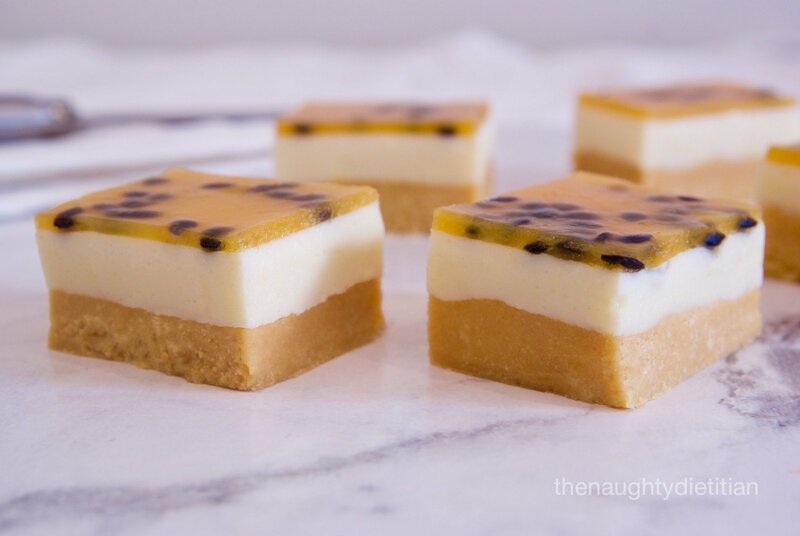 It’s got the perfect balance of passionfruit flavour and will have you going back for a second and third slice! I must admit I get a little nervous working with gelatine, but it’s a super simple recipe to make and doesn’t require any baking. Got to love that! I took inspiration from my Lemon Jelly Slice and a recipe from an Australian Woman’s Weekly magazine. Do you have a go to slice you bake for work colleagues or meetings? Make sure to leave me a comment below if you do! 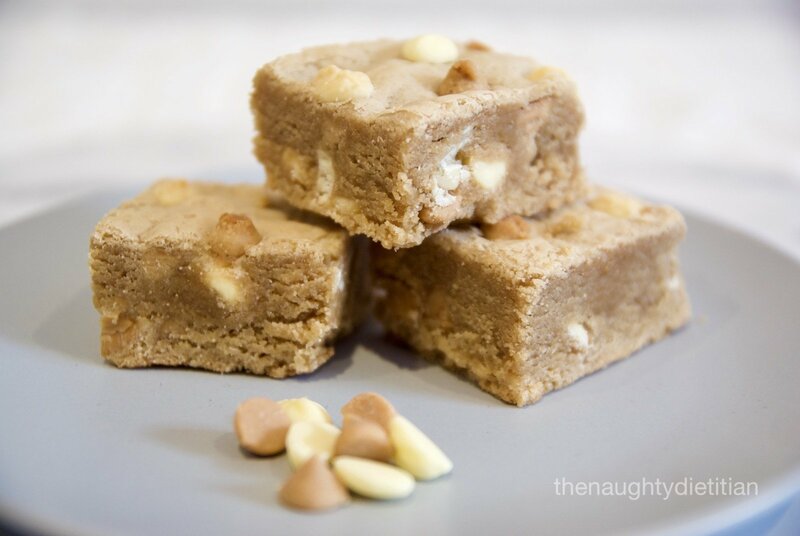 These Gluten Free Peanut Butter White Chocolate Blondies are the perfect treat for morning or afternoon tea this Mother’s Day! They’re super quick to make, taste heavenly and only require one bowl for mixing, so what’s not to love? If you’re looking to impress your Mum with something a little different I’d also highly recommend my Lemon Curd Cheesecake or Pecan Blondies. Yum! Although I don’t get the chance to celebrate with Mum this weekend, I’ll be sending her these treats to enjoy while she’s busy creating floral arrangements for all the other Mums out there to enjoy. Wishing you all a lovely Mother’s Day and weekend ahead! To celebrate the new year I’m sharing this incredible Gluten Free Chocolate Pistachio Hedgehog Slice! This hedgehog slice is seriously cafe quality and a MUST bake for any hedgehog lover. It contains delectable dark chocolate and that perfect nutty pistachio flavour. I plan on gifting it tonight to our neighbours to wish them a Happy New Year! They generously gave us a gorgeous box of hand selected Koko Black Chocolates for Christmas. I must say they have exceptional taste when it comes to chocolate, so I hope they like this slice. Reflecting on the past few months of blogging (or lack of in my case…), I’ve decided my goal for 2017 is to bake and blog weekly. I know it’s a big goal to bake & blog regularly, amongst caring for a toddler, myself and heading back to work part time. But I love baking and sharing recipes with you all. Now this is where I need your help! Can you do me a favour? I’d really love your support and motivation to achieve my goal! This might be through inviting friends or loved ones to like my blog, sharing particular recipes, or even getting in contact with me to let me know you’ve made one of my recipes?! 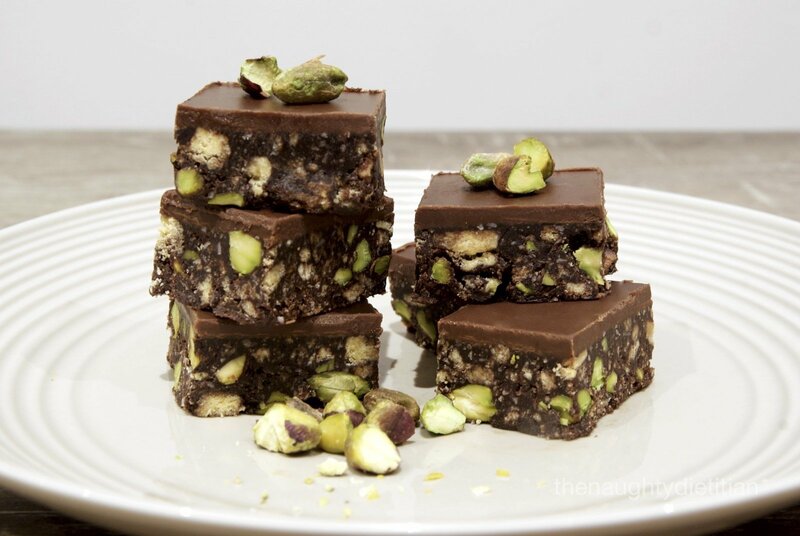 You might even make this Gluten Free Chocolate Pistachio Hedgehog Slice? I have a Facebook page, Instagram and Twitter account that you can like or share. Did you know you can also sign up to receive new recipes via email on my website too? The links to all my social media accounts are just to the right of this post. Thanks so much for stopping by and any support you can offer.